This article previously featured in The Tribune on November 25. Broadway has been in the news this week - thanks to the cast of Hamilton and their message for the next US vice president. Hamilton, of course, is something of an unstoppable juggernaut at the theatre, booked out until the latter part of next year. But was it always so? This week's shows peer behind the scenes on Broadway. Patrick Hinds is the enthusiastic host behind the Theater People podcast, a show that seeks to get to know the people who stage the plays and musicals known around the world. In a recent episode, he chatted to Thomas Kail, the Tony-winning director of Hamilton. But Hinds doesn't just explore the show of the moment, he chats at length with Kail about the build-up to the show, and Kail's past before that, as director of the likes of In The Heights and Magic/Bird. Kail's a fascinating guest to listen to, observing how he feels the role of director is akin to that of a sports coach, and how he has also been drawn towards directing the likes of Lombardi in his career, the story of Green Bay Packers coach Vince Lombardi. He also tells of how the runaway success of Hamilton started to come to light as they worked on the production, and public interest hit fever pitch even without much in the way of pre-press for the show. It's a great listen and makes a very good companion piece for the next podcast, Broadway Backstory. Broadway Backstory also comes from Patrick Hinds, this time teaming up with Today Tix to take a look at how shows came to reach Broadway. 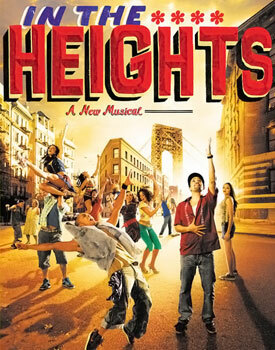 The first show under the microscope is In The Heights, directed by Thomas Kail and with music and lyrics by Lin-Manuel Miranda. Following the footsteps of the show from creation to success is fascinating, with so many places along the way where things could have gone wrong, but just fell together right - from the invitation to use a theatre space inside a drama bookshop that happened to have the spare space after a fire forced its relocation, to the connections made that brought the show its producers. There's also the changing face of the show itself, with Miranda saying how a key plot element, involving a gay character exploring his situation in a Latino neighbourhood, was rethought after a producer pointed out it had been done before. Miranda initially bridled against the change until the producer sent him to watch Avenue Q and there, Miranda saw his main plot play out in a subplot of the other show and admitted that something needed to change. This is a thorough exploration of the history behind the show, and really makes you appreciate the years of effort it takes to transform an idea into a reality. This show is one I wish I could love - but they are presently plagued by technical troubles, it would seem. I listened to two different shows, and each had substantial difficulties with the sound quality. And yet, if you can listen through the murk, the expertise on hand is top notch. In one show, we had Adam Roberts join host Michael Lueger to talk about music theory in musicals - such as the signature tunes of different characters and how the music can signify their development, such as with Henry Higgins in My Fair Lady. He also spotlights moments where artists confound expectations, such as in A Chorus Line, where the audience expects individual leads to emerge, but each member of the chorus line has their own story, their own song, their own motifs and the audience is left to choose for themselves the characters they are drawn towards. The second show, a look at performances of medieval plays in the 21st century, suffered most of all from poor sound quality - but again the expertise in the discussion was top notch. I do hope they get their technical hiccups sorted - if they do, this is a show that really can open your eyes to aspects of the theatre industry.